There is a new bean-to-bar chocolate maker in town, and this one has a name we can all pronounce. It's Dandelion Chocolate, the inspiration of two Stanford pals who sold their tech company, Plaxo, and reinvented themselves as chocolate makers. About 1 1/2 years ago, Todd Masonis and Cameron Ring started tinkering around with different types of cacao beans in their San Jose garage. (I love the image of a Silicon Valley garage, once crammed with computers and nerdy programmers, remodeled for antique winnowing machines and melangeurs.) Now they are plotting a factory/retail shop/cafe in the Mission at 740 Valencia, just a stone's throw from Bi-Rite and Tartine. 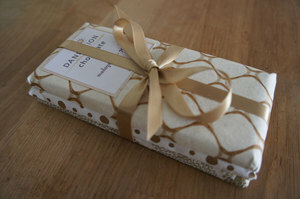 Unlike the other big names in the local bean-to-bar chocolate scene, Dandelion is a micro-batch chocolate maker. (As in, roasting 1 kilo of beans at a time - something like making 3 batches of chocolate chip cookies for your child's bake sale.) The single origin bars we tried (70% Madagascar and 70% Venezuela) made it clear this is for true dark chocolate lovers. The flavors are intense and the texture is not as smooth and creamy as popular European bars like Valhrona and Cluizel. At the moment, Dandelion uses only nibs and sugar in their chocolate. No soy lecithin, cocoa butter or vanilla. But sweet tooths, don't despair. Plans are in place for building a cocoa butter press and enhancing the line to include semisweet bars and even milk chocolate. Oh, and here's how... Make it a point to visit the next New Taste Marketplace in Potrero Hill, scheduled for July 16. This monthly community market works on a sliding scale entrance fee, giving you access to some of the best up-and-coming food artisans in SF. While chatting with Dandelion, check out SodaCraft for seasonal yeast fermented soda, NeoCocoa for her new peppermint truffles and Nute's Cupcakes for cupcakes with an Asian flair. Have you tried Dandelion? Please do, and let us know what you think!